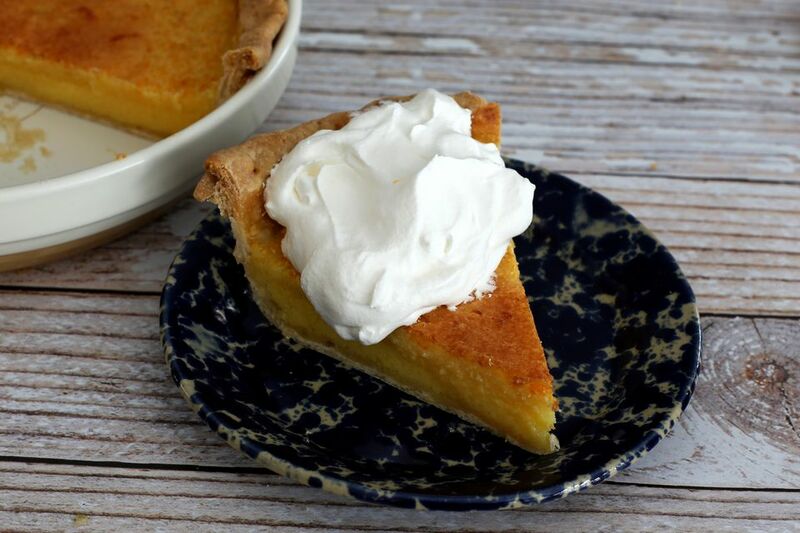 This refreshing orange chess pie is an amazing dessert, and it can be enjoyed any time of the year! With fresh orange juice and grated zest and fresh lemon juice, it is bright and bursting with citrus flavor. I've included a simple pie crust recipe, but you can use a frozen crust or refrigerated pie dough. Follow the instructions for partially baking a pie crust. Put the 1 1/4 cups of flour, 1 teaspoon of salt, and 1 teaspoon of sugar in a food processor and pulse to blend. Add half of the chilled butter pieces and pulse 5 or 6 times. Add the remaining chilled butter pieces and pulse another 5 or 6 times. You should have visible pieces of butter in the mixture with some the size of peas. Sprinkle about 2 tablespoons of the ice water over the flour and pulse a few times. Add more water, about 2 to 3 teaspoons at a time, pulsing a couple of times after each addition. When the mixture begins to clump together, turn it out onto a floured surface. With your hands, knead just enough to shape the dough into a disk. Overworking the dough can cause shrinkage when the pie is pre-baked, so handle it as little as possible. Wrap the disk in plastic wrap and refrigerate for about 45 minutes. Roll the disk out into a 12-inch circle about 1/8-inch thick. Keep checking and adding flour to the work surface if you notice any sticking. Fit the pastry into the pie plate and crimp the edge as desired. Line the pastry with parchment paper or foil and fill about 2/3 full with pie weights or dried beans. Bake for 15 minutes. Remove the parchment or foil with the pie weights. Prick the dough all over, and then bake for about 5 minutes longer, or just until you begin to see a little color. Remove the crust to a rack and reduce the oven temperature to 350 F (180 C/Gas 4). In a mixing bowl combine the 1 1/2 cups of sugar, 1 tablespoon of flour, cornmeal, 1/4 teaspoon of salt, 6 tablespoons of melted butter, the milk, orange zest and juice, the lemon juice, and the lightly beaten eggs. Beat with an electric mixer until well blended. Pour the orange filling mixture into the partially baked pie crust. Bake (at 350 F (180 C/Gas 4)) for about 40 to 45 minutes, or until set. Check the pie for browning after about 20 to 25 minutes. If necessary, put a pie shield or homemade foil ring over the edges of the crust to prevent over-browning. Remove the pie from the oven and let it cool on a rack. Chill before serving. Serve this pie with freshly whipped cream or thawed whipped topping.